← How well can you articulate your strategic advantage? Is it there – but hidden? Think back. It’s Saturday morning. You’re watching cartoons. BEEP. BEEP. Roadrunner zooms by in a cloud of dust. Miraculously, he stops. Right at the edge of the cliff. It’s a great place to be! Long pause. Wile E. Coyote streaks by. Uh, oh. 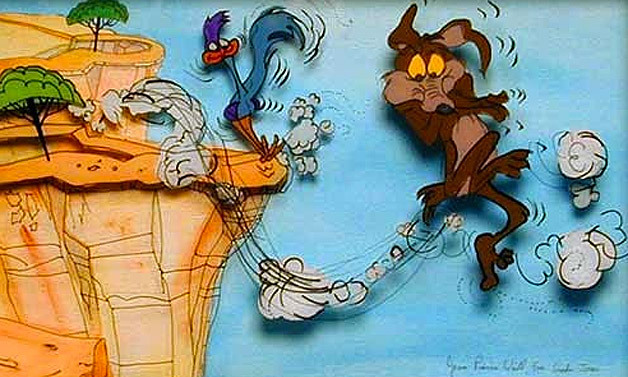 Wile E.’s over the edge, hanging on for dear life. Then, SPLAT. Most of us fear falling off the cliff – looking stupid, losing face. But what about the other extreme? If you think you’re playing it “safe” by staying away from the edge, you’re wrong. It may not be as immediately painful as falling off the edge, but there’s risk there, too. You’re boring. Generic. You don’t motivate prospects, clients, employees or anyone else. But there’s an antidote: being more fearless. And you can do it strategically so you can find your edge without playing it too safe – or falling over the edge. Start by reading the Fearless Branding Manifesto for some ideas. Download it here. This entry was posted in Branding, Differentiation. Bookmark the permalink.